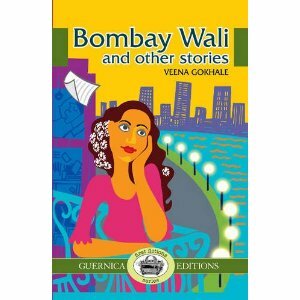 A former Bombay journalist, Veena Gokhale has penned her first collection of 12 short stories set almost entirely in India. While her stories set in Bombay will impart a genuine taste and flavour of India familiar to Indophiles, there is a definite departure from traditional India in this collection, giving a sense that change is in the air. The author throws in a few surprises, such as a story set in Japan in the last third of the book, serving as a type of aesthetic contrast, in addition to a tale about a young Canadian woman who finds moving spiritual enlightenment in Kathmandu. For anyone who loves stories about the Indian subcontinent, this collection offers some gems that are both evocative and visually pleasing. The title story, “Bombay Wali,” also the collection’s longest, brings together a number of young professional women eking out an existence in Bombay. Renuka’s dreams are shattered when she has her bag slashed and money stolen outside a bank. Too ashamed to tell her father, she entertains the idea of robbing a bank, a plan suggested by her friend Gulnar on a girls’ night out. In desperation, Renuka agrees to take part. For their disguise, six burqas are purchased, and then the plans abruptly change. This leads to a less than satisfying ending to an otherwise original and engrossing tale. “Bombay Wali” is a welcome shift from the traditional portrayal of Indian women. Equally audacious is “the Room,” which opens with a young couple, Suj and Vikram, smoking an illicit substance. As their relationship becomes more intimate, Suj resists the pressure to take a key for a room from Vikram’s unsavoury friend so that the couple might be alone. Although Suj is portrayed as more sexually open than her friends, as the reader witnesses, the stakes are still high for even the most minor displays of public affection. My favourite in the collection is “Zindagi Itefaq Hai” (Life is Chance). Vishwanath Iyer is an investigative journalist at The Disquieter, a small-time Bombay rag. As fate would have it, page two of his report, which contains a key quote, is blown out the window and into the alleyway. Unable to retrieve his page two, Vish rushes to the station where his source, a judge, is catching a train. Both humorous and realistic, this story is easy to visualize, “The station was a tide of bodies, a cacophony of sounds – human and mechanical, a solid flow of heat-resistant energy. Nevertheless, the announcer’s steady voice, talking alternatively in Marathi, Hindi and English, managed to prevail over the chaos.” In spite of its somewhat weak ending, “Zindagi Itefaq Hai” feels like the beginning of a very entertaining full-length novel. Other noteworthy stories include “the Tea Drinker” about an adolescent boy who befriends a rich social outcast and “Freire Stopped in Bombay,” which details the ravages of hunger on a poor student who is too proud to borrow money. In addition, despite its pedestrian title, “Middle Age Jazz and Blues” is the most beautiful story in the collection. At a jazz concert, middle-aged single Feroza is struck by the vision of the love of her life, who died tragically. As is usually the case, some stories are not as interesting as others. However, in spite of some vague references to “things” and “stuff,” a handful of heavy adverbs and some unconventional dialogue tags, Veena Gokhale shows genuine promise as a short story writer and future novelist. Let’s hope she chooses to write more about the Bombay newspaper world. : Bombay Wali and other storiesTweet this!